Today, a GSA Morgan Silver Dollar Coin remembers several articles from October 14, 1896 when silver coinage was a major political topic. Is the country going to the dogs for lack of enough silver money, as the advocates of the free coinage of silver assert? “The government is still coining standard silver dollars from the bullion purchased under the act of July 14, 1890. “The amount of bullion on hand Nov. 1, 1893,when the purchasing clause of the act was repealed, was 140,699,852.67 fine ounces, costing $126,768,280, the coining value of which was $181,914,861. 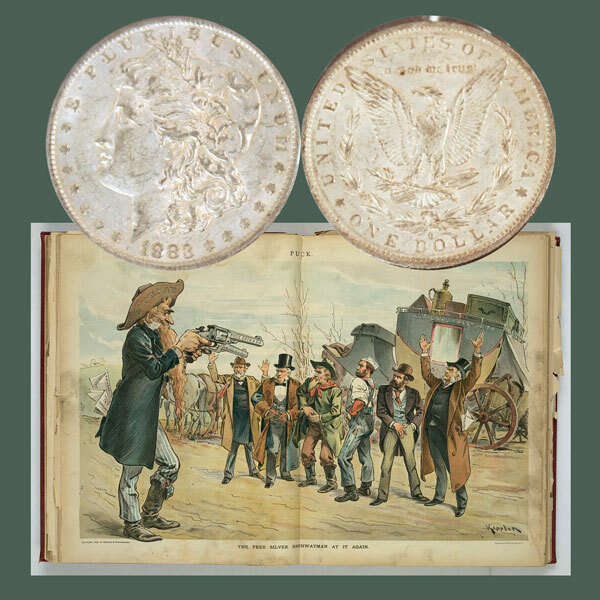 “Between Nov. 1, 1893, and Sep. 1, 1896, there were coined from this bullion 15,169,491 standard silver dollars, of which $10,410,528 represent the cost of the bullion coined and are held in the treasury for the redemption of treasury notes of 1890, while the remainder, $4,758,433, constitute the gain or seigniorage, and, being the property of the United States, have been paid into the treasury to be used like other available funds. That most of the coinage has been during the present year is shown by a table in the same circular, taken in connection with the above. Since the repeal of the Sherman act—less than three years—more than half as many silver dollars had been added to the volume of money in the country as had been coined from 1792 to 1873—eighty years. Added to the volume of money from the seigniorage onthe coinage of $16,169,491 silver dollars, from November 1, 1893 to Sep. 1, 1896: $4,758,433. Silver dollars coined 1792-1873: $8,031,238. “An unstable currency, producing instability in business and prices is peculiarly injurious to the farmer. “Neither his education nor his disposition accustoms him to watch the barometer of the exchange. “When he has conducted his business with prudence and skill, with the familiar knowledge and the sagacious estimate of all the circumstances that belong to it, he ought to be safe. “He ought not to be subject to the tremendous agency of an unseen cause, which may disappoint his wisest calculations and overwhelm him in sudden ruin. “He ought to be secure in the tranquility of his fireside, from the curse of an unstable and fluctuating currency.” —The late Samuel S. Tilden in a speech at New Lebanon, Ohio. The Man Who Has a Silver Dollar. Knows that it is worth 100 cents for the purchase of whatever he may need for himself and his family, although the actual value of the silver in the coin is only about fifty-three cents. Why? Simply because the government of the United States bought the silver, coined these dollars and put them into circulation and has given its pledge to keep each of them worth 100 cents, no matter how much the bullion value of the silver used in making it may decline. But nobody knows what the silver would be worth under the proposed system of free coinage. Under free coinage of silver the government would not put out silver dollars on its own account, and its guarantee would be withdrawn. Then what, under free and unlimited coinage, would take the place of the government guarantee which now supports the silver dollar at par? Nothing. For the certainty of the government’s guarantee it is proposed to substitute the mere chance that free coinage will raise the bullion value of the silver in the dollar to 100 cents. What does the change amount to? No nation on earth has ever been able by the free coinage of both gold and silver, at any ratio, to bring and keep the bullion value of both metals to the coinage value, although the difference to be overcome was very little, and the difference to be now overcome is very great. Why American Workmen Should Vote For McKinley and Honest Money. Capital and labor are natural partners—each unprofitable and impotent without the other. Without the employment of capital labor would be idle. It has been very well said that business engagements involve time contracts; that all contracts are dependent upon payments; that no business man will enter into contracts until he know with inerrant explicitness just how much money he is to receive. He must do so in order to be able to gauge how much he must allow for material and how much for wages. If he does not there must be pinching, and the pinching will come on the wages. The Republican party proposes to settle all questions of future payment by saying that the dollar received by capital shall be worth 100 cents and that the dollar which labor receives for its honest toil shall be as good as the dollar which capital receives. The money which the working man gets as wages is the only reward he has out of that which his labor creates. Surely that would be of the best—stable and unchanging. The working man cannot gamble on his wages. They are not too great at their best. The dollar of Wall street, as it has been called, in not any too good for the laborer. He should not be content with loss. Hoist by Their Own Petard. One stock argument of the silverites is that silver has not depreciated in price, but that the price of gold has appreciated. This is bad, very bad, they say. The price of gold is too high, much too high, they argue. But in the next breath that they draw they clamor for the enactment of a law that would, in their opinion, immediately advance the price of silver to $1.29 per ounce—an appreciation of about 50 percent at one jump! In short, their whole purpose appears to be to make silver worth as much as gold, or as near that price as possible. If the present price of gold is bad, very bad, for the country, do not the efforts of Bryan and the free coinage promoters to put up the price of silver merit universal condemnation—their own along with that of the rest of the world? Sailorman Sewall of Bath, Mo., is a slave to custom. He admits it himself and laments it. His gold contracts, he says, are gold contracts because it is customary to make them so, and has been for 40 years. He would just as soon be paid in silver and, mayhap in lead or leather; but so long as it is fashionable to insert the gold clause is inserted, and there’s an end of it. The proverb says that one might as well be out of the world as out of fashion. “He knows if he tells the world that the world will not believe him; therefore, he wants the government to do his lying for him, and to stamp these lies indelibly upon his silver product. The GSA Morgan Silver Dollar Coin shows with an 1896 depiction of The Free Silver Highwayman at It Again by Keppler.